Formed using rules similar to the All Cap Core 50, our All Cap Core 100 is also designed to offer a solid core investment portfolio. What sets the two portfolios apart is the number of stocks in each. The All Cap Core 50 is composed of the top 50 stocks selected using our rules. The All Cap Core 100 doubles this number, providing a much greater level of diversity. Increasing the diversity of investments in a portfolio is a common approach to minimizing risk while still focusing on capturing value. By having stocks in a variety of market sectors, investors are provided some shield against sudden fluctuations in parts of the economy. With the All Cap Core 50 and 100, Summit’s portfolio managers offer an extraordinarily well diversified core investment. Hand picking this many stocks yourself across all market capitalizations and economic sectors would be time consuming and personal preferences could skew the selection to the detriment of performance. Summit relies on time-tested rules to quickly and dispassionately select the stocks needed to provide a strongly diversified portfolio. Both the All Cap Core 50 and the All Cap Core 100 are automatically rebalanced and refreshed periodically. This guarantees the portfolio stays diversified and no one stock or market sector dominates. 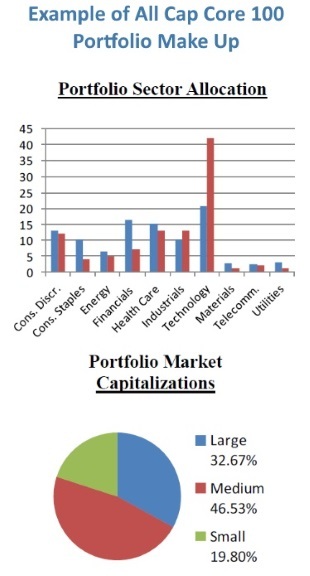 These portfolios offer excellent exposure to all major stock market sectors. To begin investing with a rules based, diversified portfolio, contact Summit’s financial advisors today.